Noptions : Windrose Armoury, We Bring History To Life! In addition to the nasal, it will soon be possible to order the Norman helmet with a Viking style ocular. Pictures and Pricing will be coming soon to this space. 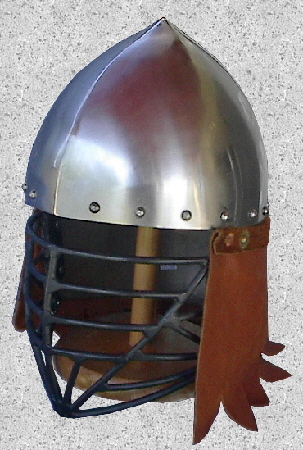 All Norman helmets are built by Windrose Armoury using a simple dished cheek plate and shaped rear (wrap) plate. If the buyer wishes to attach a mail or leather drape to the back side of the helmet, it is usually best to use a single plate wrap that fully encloses the helmet, and forgo the use of separate cheek plates. 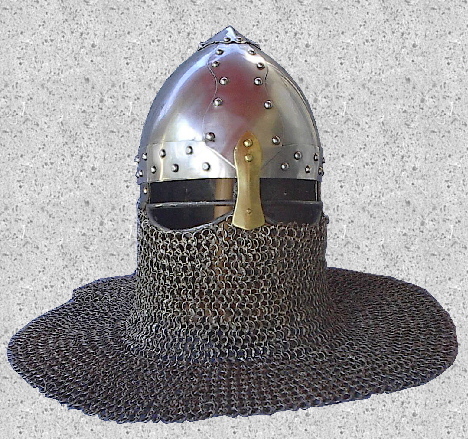 Riveted chain mail drapes may be purchased and installed by us on this style helmet for $325. Mild steel helmets receive flat ring, wedge riveted mild steel mail, while stainless helmets receive riveted round wire stainless steel drapes. All mail used is imported.